Book Giveaway: Win a Copy of Concordia Commentary: John 1:1–7:1! 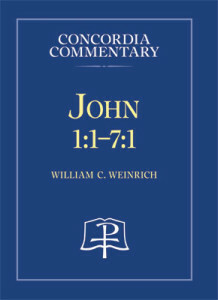 CPH is excited to announce the release of the newest volume in the Concordia Commentary series: John 1:1–7:1 by William Weinrich. And, as we often like to do, we’re celebrating the book’s arrival with a giveaway! During this time of year, we often hear people say “Jesus is the reason for the season.” But Jesus is not just the reason for the Christmas season, He is the reason for every season and for life itself! As Dr. Weinrich puts it: “There is no life apart from him who is, precisely as the incarnate and crucified One, himself Life (Jn 14:6).” Jesus is also the reason the Gospel of John was written: “The Gospel is written to persuade and to instruct those who have not yet received Jesus to believe that he is the Christ, the Son of God, so that they may have life in his name (Jn 20:31).” Because of this, we decided to see just how many times “Jesus” is mentioned in Dr. Weinrich’s commentary. Whoever is able to guess closest to the correct number (without going over) will win a copy of the book! Guess how many times the word Jesus appears in Concordia Commentary: John 1:1–7:1.
b. Leave a comment on this Facebook post with your answer using the hashtag #JesusinJohn. All tweets and comments must be received by Wednesday, December 9 (by 11:59 p.m. Central Standard Time). The person whose guess is closest to the correct answer, without going over, will win. Fine print: The winner will be notified via Direct Message on Twitter or Private Message on Facebook. If the winner fails to respond in three days, a new winner will be chosen. The winner will be sent an affidavit of eligibility by email. One entry per person. Must be 18 years or older, and a resident of the United States. Concordia Publishing House is not responsible for lost, late, or damaged entries. Prize worth approximately $54.99. See complete rules Here.